When deciding to build a metal building, whether it be for general storage, vehicle storage, boat storage, or RV storage it’s often a difficult task deciding on how big or small you actually want to go. If you build a metal building that’s too small, you will forever wish you’d built it slightly larger, and sometimes customers regret building a structure that is far too big for their actual needs. Below is a breakdown of some of our most common metal building dimensions and the ideal use for each size. Read the following to help you better decide on what size of structure you should be aiming for. A good chunk of the metal buildings we build are between 10ft x 10ft and 30ft x 40ft. Many decide to build a small one car garage, or small storage area for their watercrafts, ATV’s, Bikes, machinery etc. They build something small but spacious enough to store some large, valuable vehicles and machinery, while also having enough space for storage and work space. These metal buildings can have dimension variations up to 30ft x 40ft, where you start to get into the larger, semi commercial grade building sizes. As well, depending on your region and local laws, many people choose to build structures significantly smaller than the 30ft x 40ft average to avoid having to obtain municipal permits and zoning paper work. This size in particular, and dimensions close to it, seem to be the most common build request we get. It is a large space that can accommodate some of the largest vehicles, machines and boats, but isn’t overly large for excessive land preparation. It holds plenty of space that can be designed in many different ways for multiple uses, and is still small enough that clear span construction can be achieved without having to install structural support beams into the center of the building. Essentially, people choose this dimension so that they have the largest open space possible, and the most room to grow without having an overly large metal building on their property. These large metal buildings are typically for storing large vehicles and machinery. A lot of our clients chose a building in this size range to store their RV, large boats, farm machinery and more. 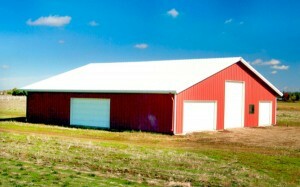 Others decide to build such a large steel building to accommodate specific workshops, some for wood working, others for painting, and some for grain and general farm storage. These large buildings are sometimes used as small offices or warehouses, and many choose to go for an even larger construction than this. Regardless, if you are going to build a metal building this large you should have sufficient need for the space, or else you will find you have far too much space than necessary for the task at hand. Contact Toro Steel today to talk to a representative about the various metal building options we have, and learn more about or size recommendations for your specific needs. Call us today at 1-877-8708676!